MELBOURNE, Australia, February 3, 2014 (ENS) – Across the world’s oceans, there is just one naval battle currently taking place – a battle between the Japanese whaling fleet of four ships and the Sea Shepherd Conservation Society’s whale defense fleet of three ships, a helicopter and six inflatables. Early Sunday morning in the Southern Ocean, the Sea Shepherd vessel the Bob Barker collided with the Japanese whaling fleet’s harpoon vessel the Yushin Maru No. 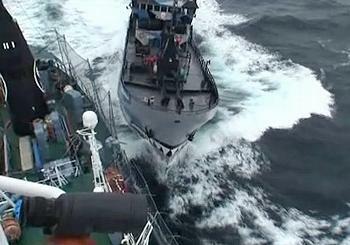 2 as the whaling vessel crossed in front of the bow of the Sea Shepherd ship, the conservation group reports. The incident was a part of an attack by the Japanese whaling fleet’s three harpoon vessels on the Sea Shepherd ships, the Steve Irwin and the Bob Barker, which began just after midnight, the Sea Shepherd captains say. The Japanese whalers were trying to deter the Sea Shepherd ships from their current position, blocking the slipway of the whaler’s factory ship, the Nisshin Maru. The conservation ships are frustrating the whalers by preventing them from loading aboard whales taken from the Southern Ocean Whale Sanctuary, established by the International Whaling Commission in 1994 over Japan’s objections. Captain Peter Hammarstedt of The Bob Barker and Captain Siddarth Chakravarty of The Steve Irwin say the Japanese harpoon vessels overtook the Sea Shepherd ships from the stern, crossing their bows at a dangerous distance of three to five meters. After narrowly avoiding numerous potential collisions by steering out of the paths of the harpoon vessels, the Yushin Maru No. 2 struck the Bob Barker. The whaling vessels have also attempted to foul the propellers of the Sea Shepherd ships by dragging steel cables across their bows, the Sea Shepherd captains report. The crews of the whaling vessels threw projectiles at The Steve Irwin’s small boat crew and turned water cannons on The Bob Barker’s small boat crew as they attempted to cut the steel cables. Sea Shepherd released raw video footage of the incident today, in an attempt to demonstrate that the Japanese ship was to blame. 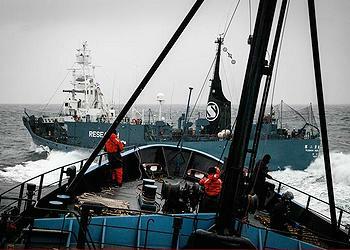 The Tokyo-based Institute of Cetacean Research, which organizes the whalers’ efforts, also released video footage, claiming that the Sea Shepherd ship The Bob Barker was at fault. Founded by Captain Paul Watson in 1977, Sea Shepherd uses direct-action tactics to investigate, document, and take action when necessary to expose and confront illegal activities on the high seas. By safeguarding the biodiversity of oceanic ecosystems, Sea Shepherd works to ensure their survival for future generations. This season, the 10th consecutive year that Sea Shepherd has sent ships to the Southern Ocean to defend the sanctuary, has proven to be disastrous for the Japanese whaling fleet, which claims to be conducting lethal but legal research whaling under the provisions of the International Whaling Commission treaty. The IWC imposed a global moratorium on commercial whaling in 1986 after many of the world’s large whale species had been driven nearly to extinction by centuries of commercial whaling. The Japanese have never abided by the moratorium and began a system of self-granted whale killing quotas in 1987. Each year, the Japanese give themselves permission to kill 950 minke whales in the Southern Ocean as well as 50 fin whales and 50 humpbacks. This year, early interception of the whaling vessels and a persistent chase has enabled the Sea Shepherd fleet to effectively suspend whaling operations and prevent dead whales from being hauled up the slipway of the Nisshin Maru. The Sea Shepherd whale defense campaign, this year called “Operation Relentless,” is being conducted by Sea Shepherd Australia as was the campaign during the 2012-2013 season. The Australian branch took over the whale defense campaign from the Sea Shepherd’s founding chapter in the United States after a lawsuit brought by the Institute of Cetacean Research was successful in obtaining a December 2012 court injunction from the U.S. Ninth Circuit Court of Appeals prohibiting Sea Shepherd vessels from approaching closer than 500 yards to the whaling vessels. After the 2012-2013 whaling season ended, Japan’s Institute of Cetacean Research went back to the Ninth Circuit Court, asking the court to hold Captain Watson, the Sea Shepherd Conservation Society, current and former SSCS volunteer board members, and SSCS’s administrative director in contempt of court for allegedly failing to comply with the injunction during Operation Zero Tolerance, OZT, the 2012-2013 Antarctic Whale Defense Campaign. A trial on these contempt allegations was held before Appellate Commissioner Peter Shaw in Seattle, Washington from October 28 through November 6, 2013. On Friday, Commissioner Shaw issued a 79-page report, which repeatedly rejected ICR’s arguments. Shaw found that Watson, SSCS, and the SSCS leadership responded reasonably to the injunction, for example, by deciding to halt SSCS’s participation in OZT following the injunction. The Commissioner specifically rejected ICR’s claim that SSCS attempted to ignore or evade the injunction. “Ultimately, the responsibility for the incursions of the safety perimeter and any other violation of the injunction lies with SSAL and the captains who reported to SSAL, but plaintiffs have not sought a remedy in this court over SSAL or those captains, and it is doubtful that jurisdiction exists to do so,” wrote the commissioner. While Commissioner Shaw’s recommendations are welcome news for the founder, officers, directors, staff and supporters of Sea Shepherd Conservation Society, the organization is aware that they are recommendations, and now awaits a ruling in the case by the three-member panel of the Ninth Circuit Court of Appeals that first issued the injunction.